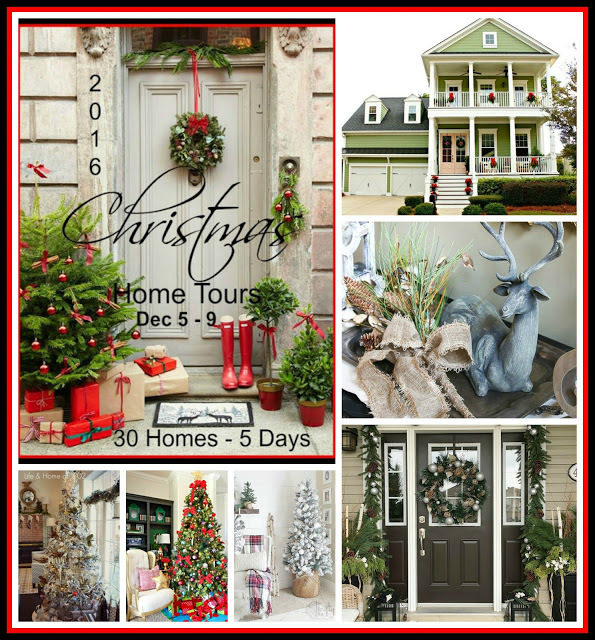 It's an exciting day, it's time for the 2016 Christmas Home Tours hosted by Marty from A Stroll Thru Life. Marty is the sweetest hostess, and has some of the most loyal readers around! If you're joining us from Life and Home @ 2102, welcome and I'm so glad that you're here! 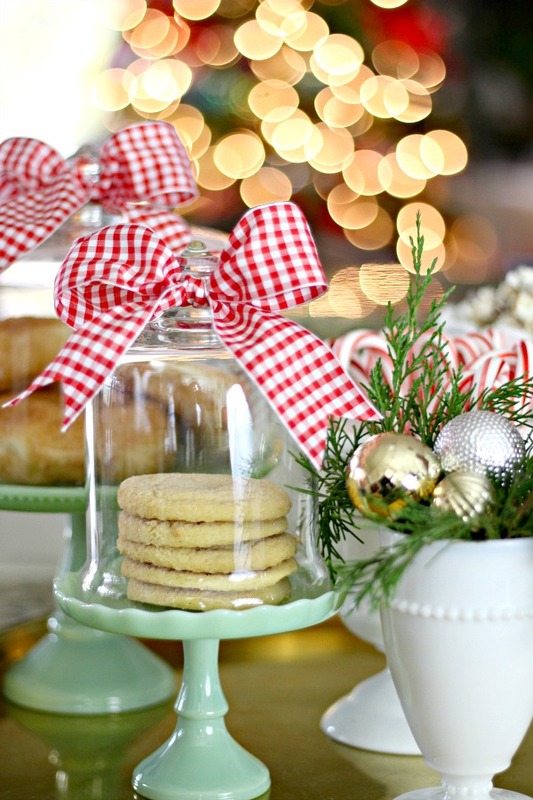 Vel loves color and especially green just about as much as I do, and I saw plenty of black and white stripes around her pretty Christmas living room, too. 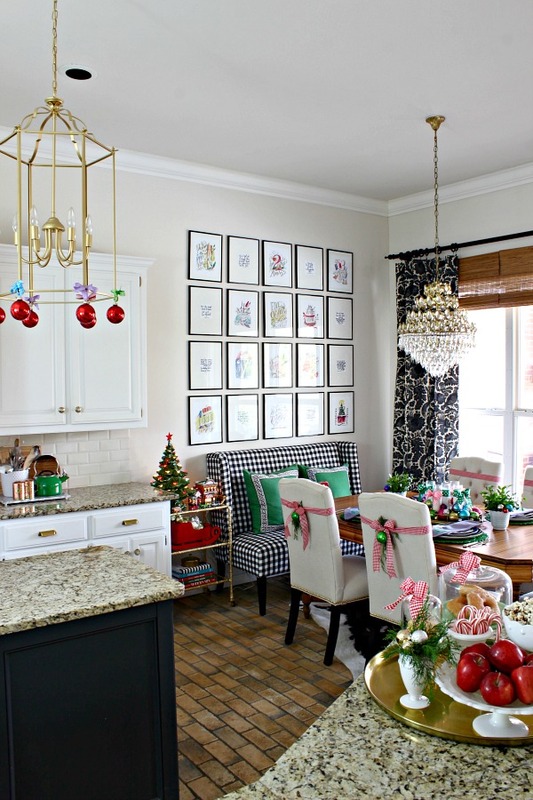 Today I'm sharing my kitchen, breakfast nook, and powder bath all dressed up for Christmas with you. We're quickly approaching 10 years of living in this house, and have been working on something or another all along the way. I love traditional red and green at Christmas, but this year I've added some jewel tones to the color palette also, and I'm in love with the mix! After a trip to England and a visit to Windsor Castle two years ago, I returned home wanting to gild all the things! 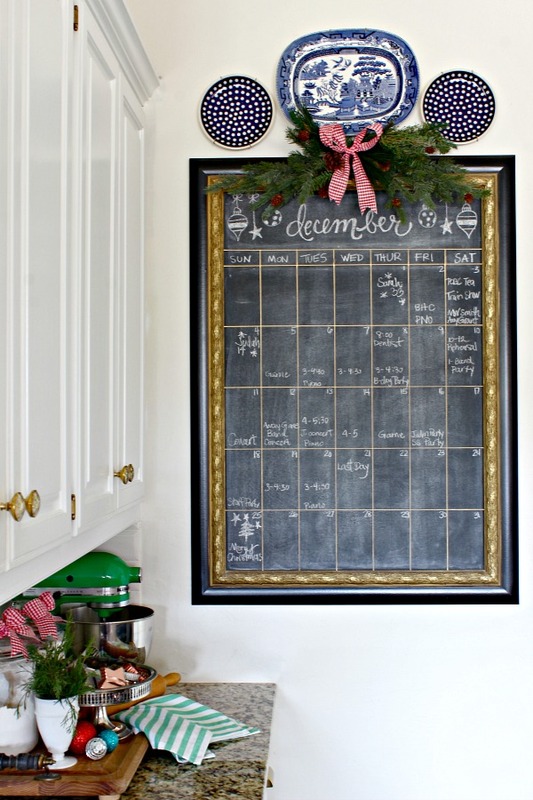 Right about the same time, I was painting my kitchen, hence the gold trim on the pantry doors. 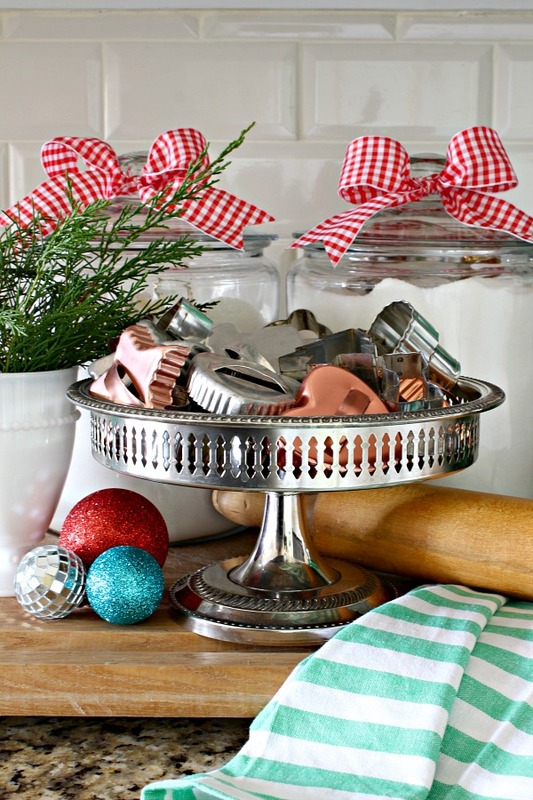 Have you seen The Pioneer Woman's new line at Walmart? 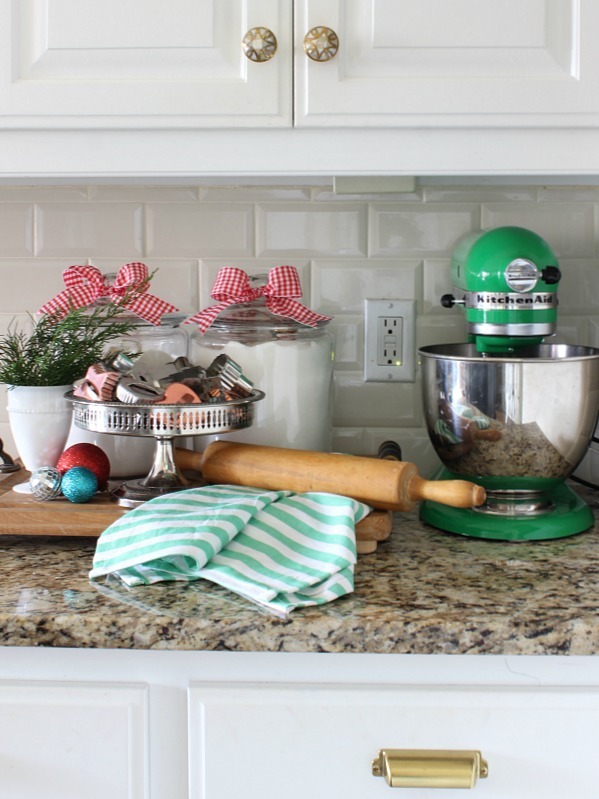 These replica jadite cake pedestals are darling... I've asked my Santa for the large one to complete the set! 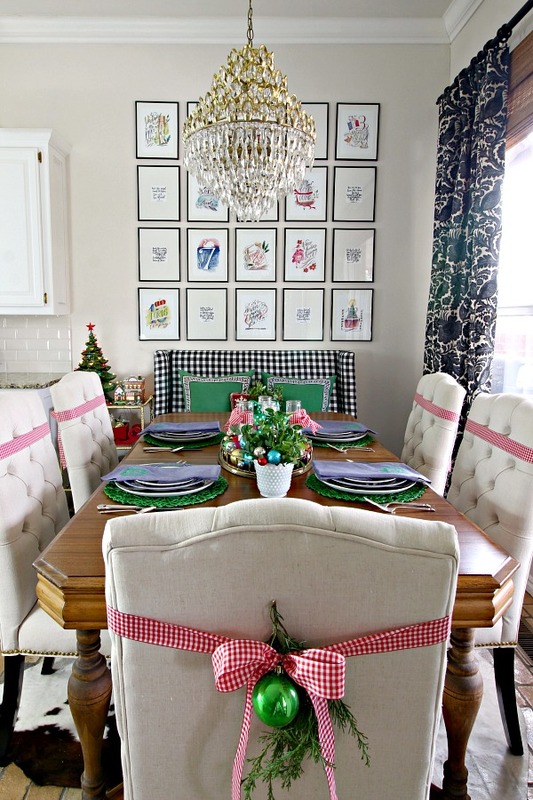 Let's keep moving, here's our Breakfast Nook attached to the kitchen, all dressed up for the holidays. If you're a regular reader, did you spot something new? I've spent lots of time in store at At Home lately as one of their Inspiration Team members, so last week when I spotted this settee I knew they must have just pulled it off of the truck! I mean... how could I resist (especially after lots of encouragement from my Instagram friends)? I've used a traditional love seat at this table a few different times, and the whole family loves the comfort, but ultimately they were too bulky or the dimensions were off. This settee is perfect for the end of our table. It sits like a generous side chair (not too deep) and is exactly the same seat height as our other chairs. I like it in this spot too because we can squeeze another person in at that end of the table if needed. I normally have a large botanical gallery wall here, but for Christmas I've replaced those prints with the 12 Days of Christmas watercolor set from Lindsay Letters. I had 8 frames left, so I filled them with sweet hand-lettered scripture cards from my friends at The Plaid Pineapple. Several of my friends have this set as well, and I've seen some cute garlands made from the cards too. 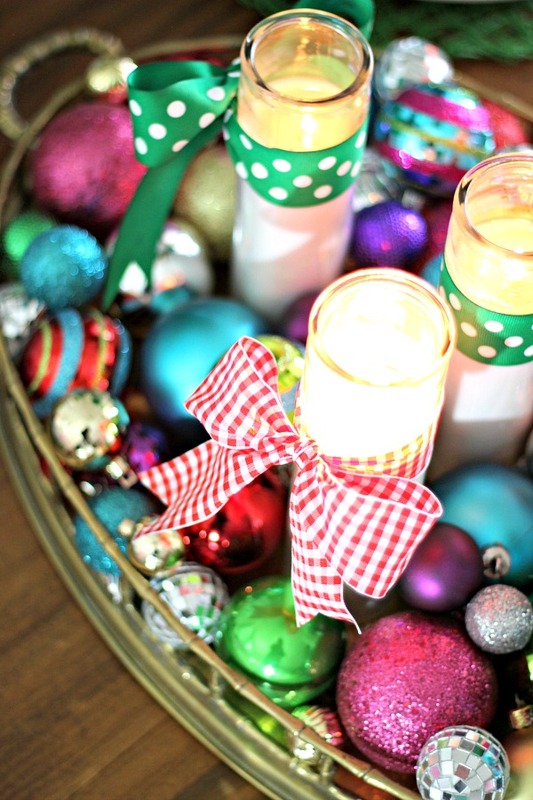 This table is set for a casual family dinner with the simplest of centerpieces- candles and ornaments all piled on a tray (have you picked up on the fact that ornaments are my go-to Christmas accessory yet?)! 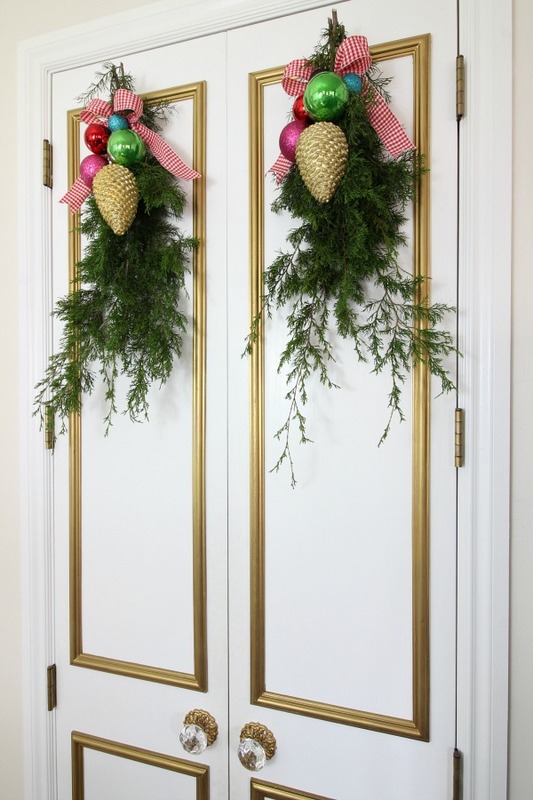 Finally today, the powder room we made over this Spring got a bit of Christmas cheer too... just a touch by adding some greenery and ornaments to the sconces. This room still makes me happy every day, it was worth every second of blood, sweat, and tears! 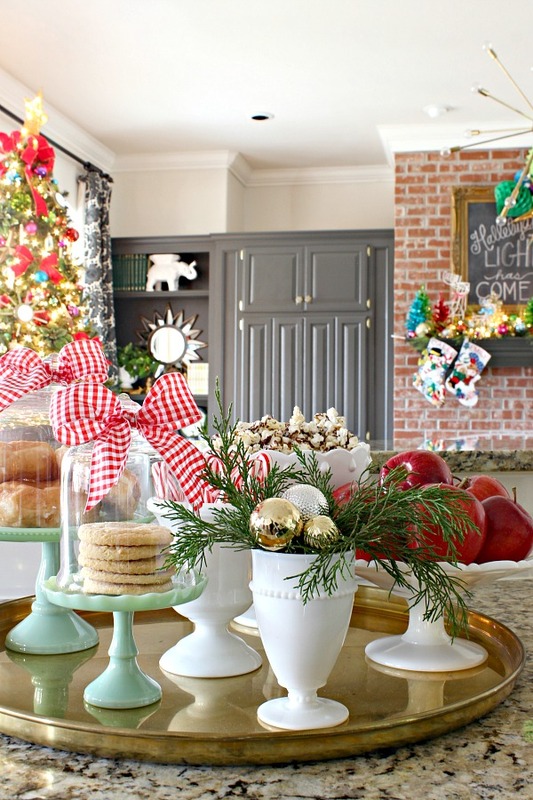 If you missed the rest of my Christmas Home Tours, I'd love for you to pop over and visit! Thank you so much for coming today! Next, head over to Carmel's at Our Fifth House. 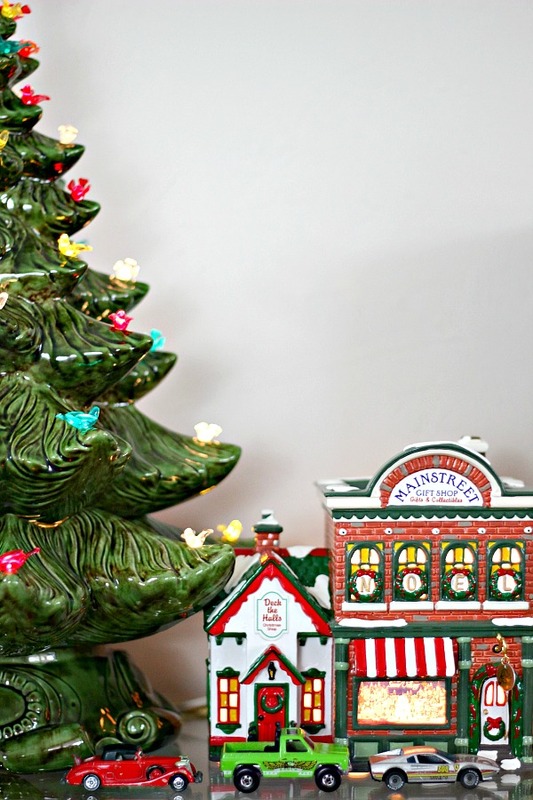 She has recently moved to the dreamy city of Charleston, SC, and is decking the halls for her family's first Christmas in their new (sixth!) home. Carmel has an amazing talent for mixing color and pattern, I can't wait to see what she has for us today. If you've missed any of the other tours this week, be sure to check those out too! I'm so glad you bought that settee. It was meant for your home. So awesome! Love all of your tours. 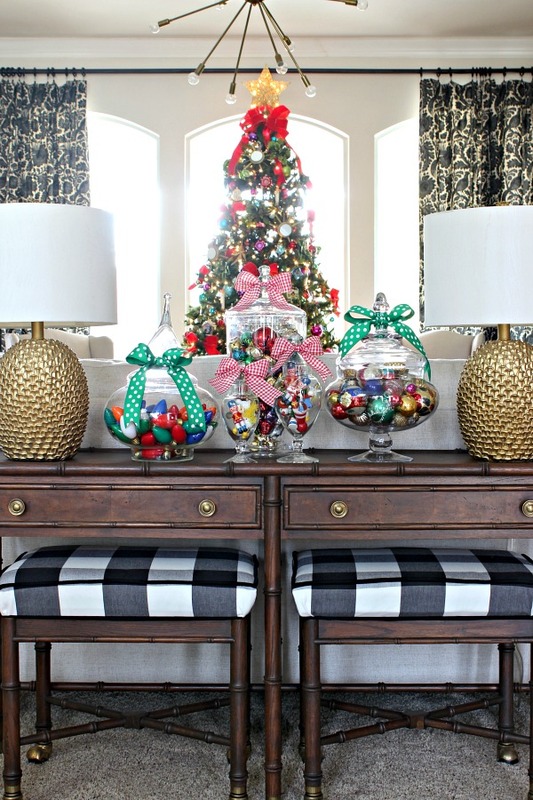 I love how you have added some more color to the mix this year, always so pretty and that new settee is amazing. What a perfect find. 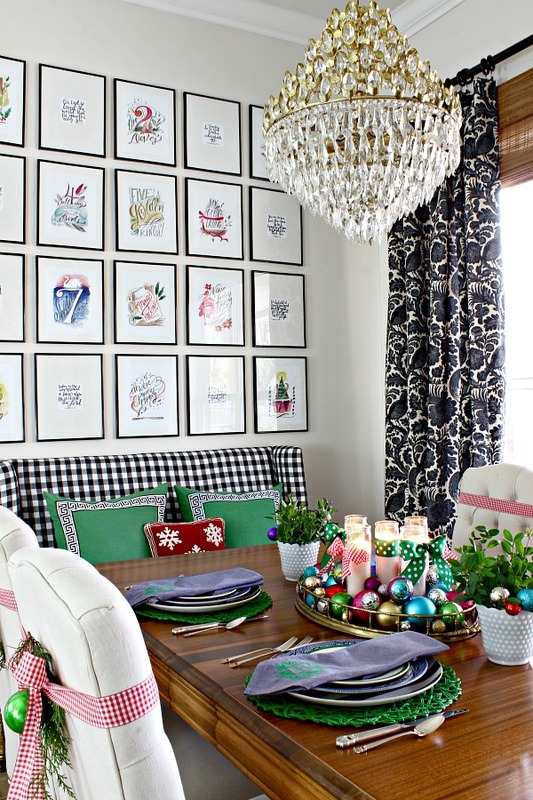 Swapping out the botanicals for the Christmas collage is such a great addition too. Of course you know I drool every time I see your powder room, it is total perfection. Thanks so much for joining the tours you home is always a favorite and a highlight. 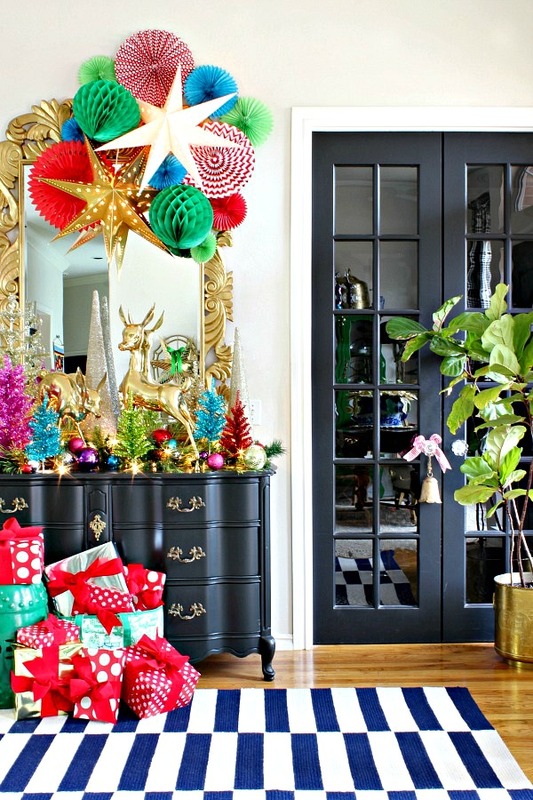 Jennifer your colorful home is truly so merry and bright. The entire tour makes my heart happy. 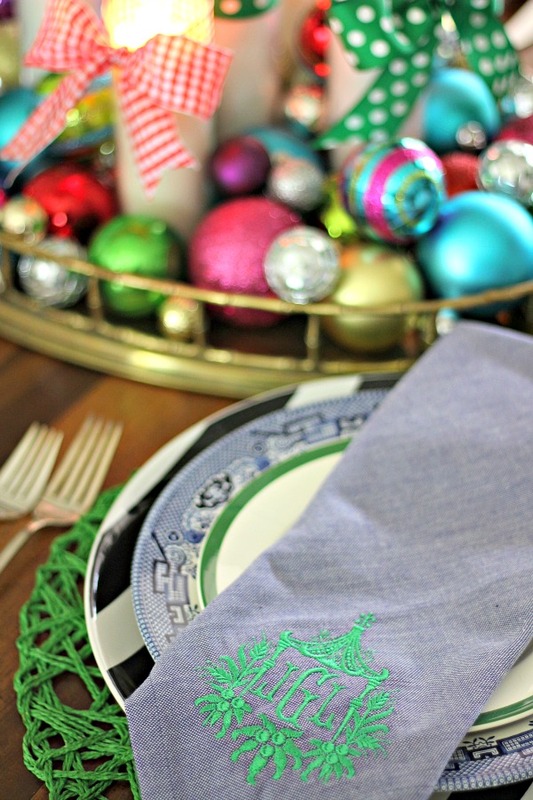 I do love those wonderful napkins and I just might have to sift through my sons Hot Wheels collection. May all the joy and blessings of the season be yours. That settee looks amazing in there!! Love your gallery wall too - cute idea! 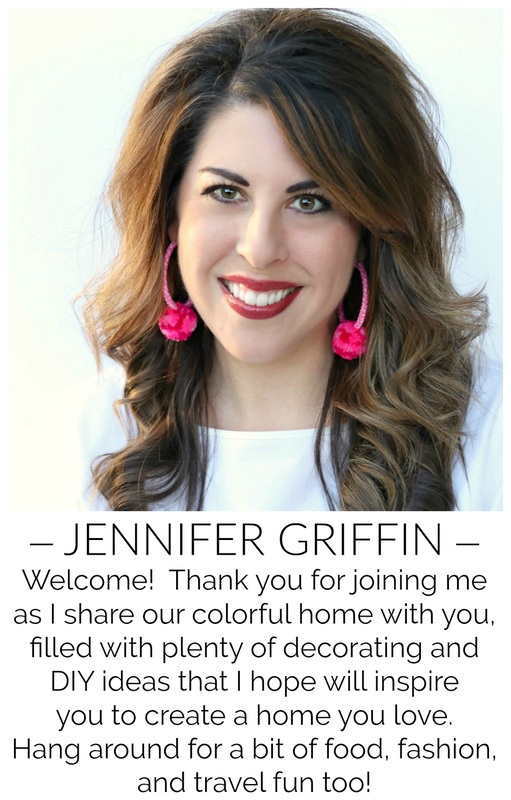 it's official, you are definitely my COLOR GURU Jennifer! you never fail to amaze us all with your dazzling colorful decor and this Christmas, once again, that trademark of yours shines! 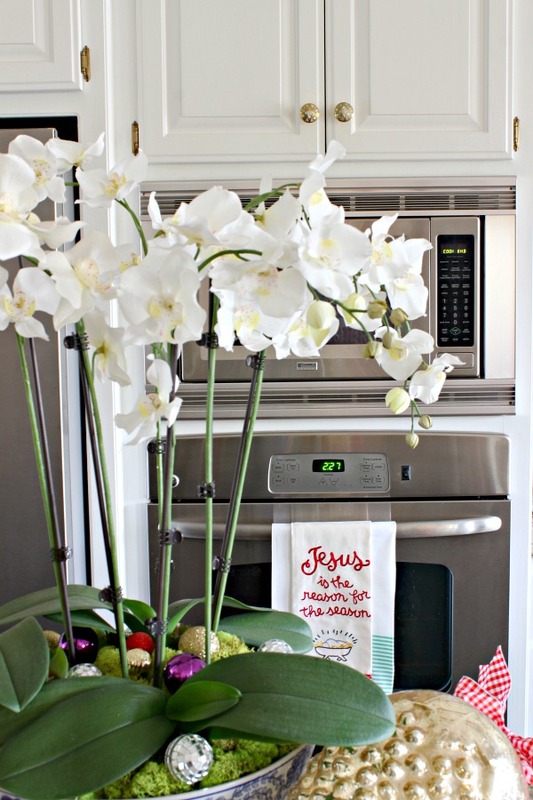 Love all the little touches in your kitchen, breakfast area and Powder room! 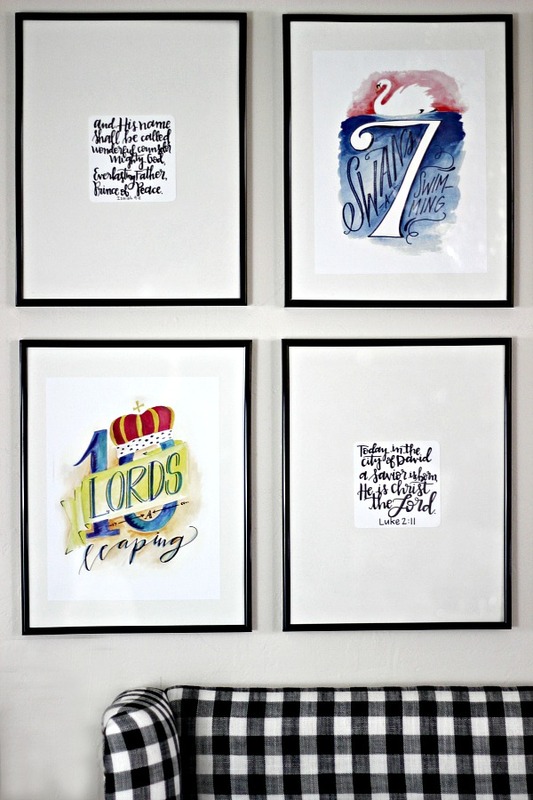 I also adore how you mixed in those lettered scriptures mixed in with your 12 days of Christmas set! Perfect! So very honored to share this home tour with you dear! Cheers! 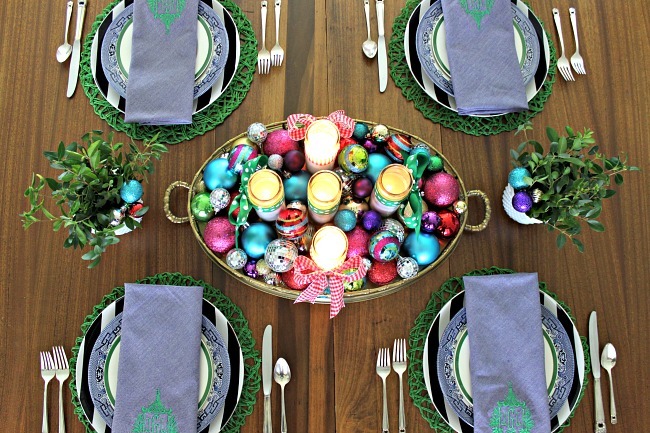 I LOVE your Christmas table!! 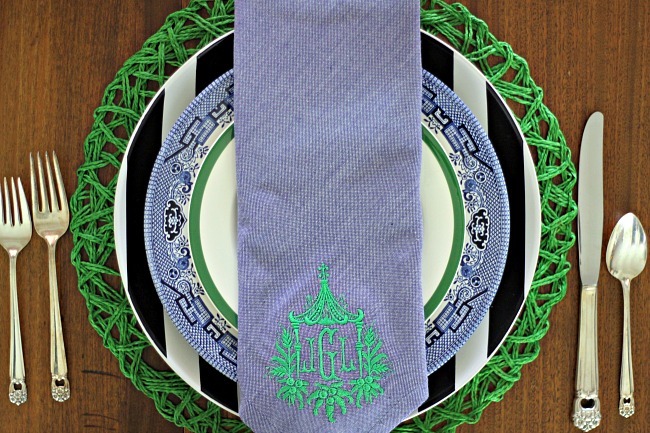 Where did you get the woven green placemats? Hi Tracy, thanks so much! I found those at Ross last year probably. Keep an eye out, seems like they have them periodically. Yay! 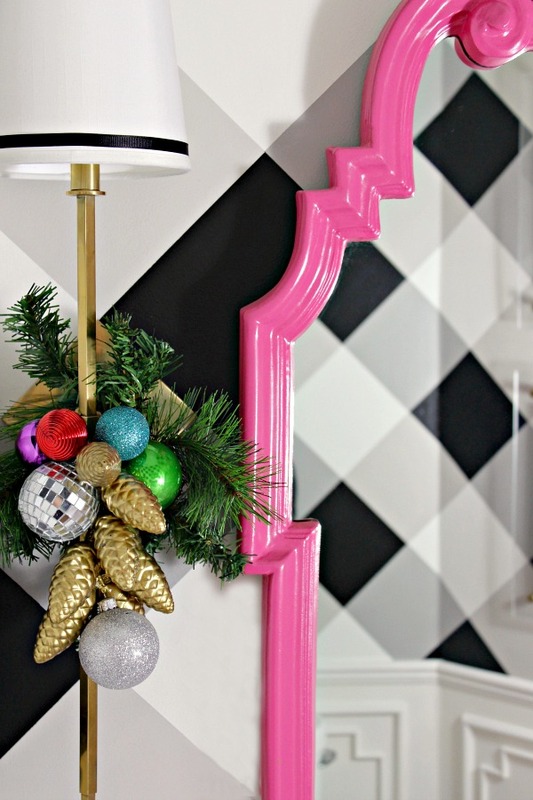 Someone else who loves as much color as I do during Christmas! I love all your little colorful touches, Jennifer! 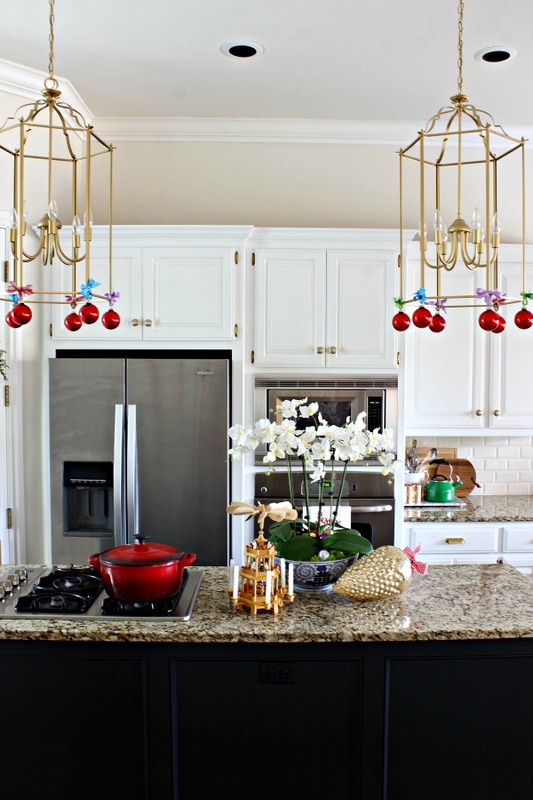 The little balls hanging from the kitchen pendants though might be my favorite! that art gallery wall is GENIUS! 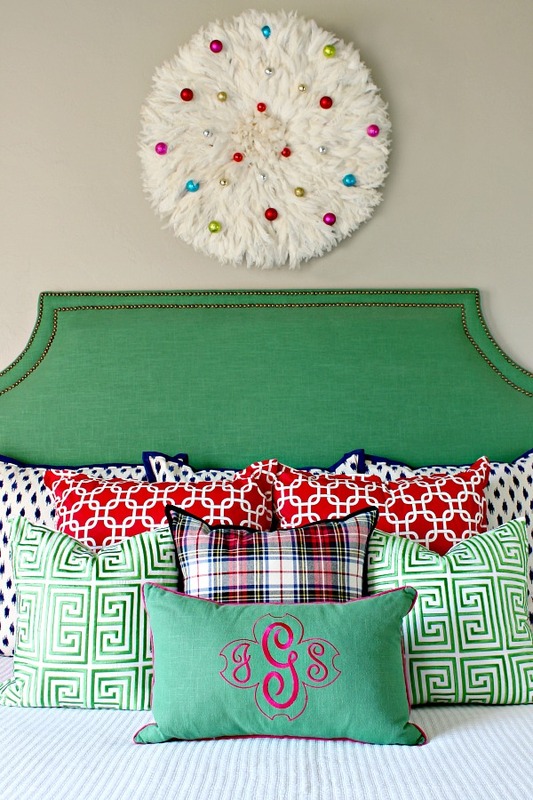 I love how you combined jewel tones with your traditional green and red. I want to do the opposite. I have mostly jewel tones and want to incorporate more green and red. You have shown me it is possible! 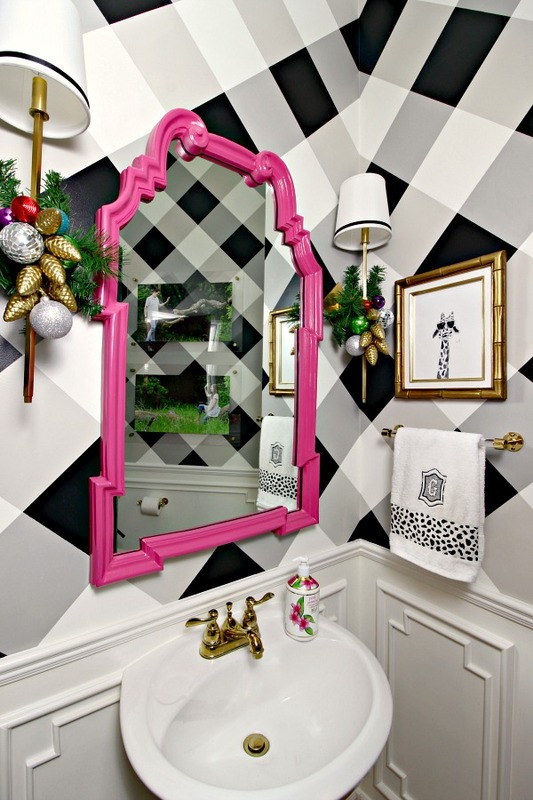 I also adore the powder room with the jewel tones! 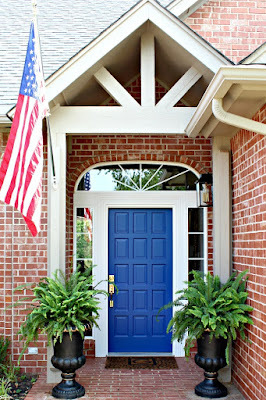 Jennifer, i always admire your use of color in your home. It's just all so beautiful. Ha....now when your guests sit down on the settee they will never want to get up....and help clean. Merry christmas to you and your family. Winter is here and I am eagerly waiting for the Christmas Eve. I so glad that I am a follower of your blog. I just enjoyed your blog and really loved this article. You have decorated this beautifully. What's that clicking sound? Oh nothing, just me pinning PINNING away over here! Beautiful! Absolutely gorgeous! I really love the black and white color scheme. It works with so many color additions. How fun to rub shoulders with you over at Nester's today! It is so happy and cheerful! I love it. 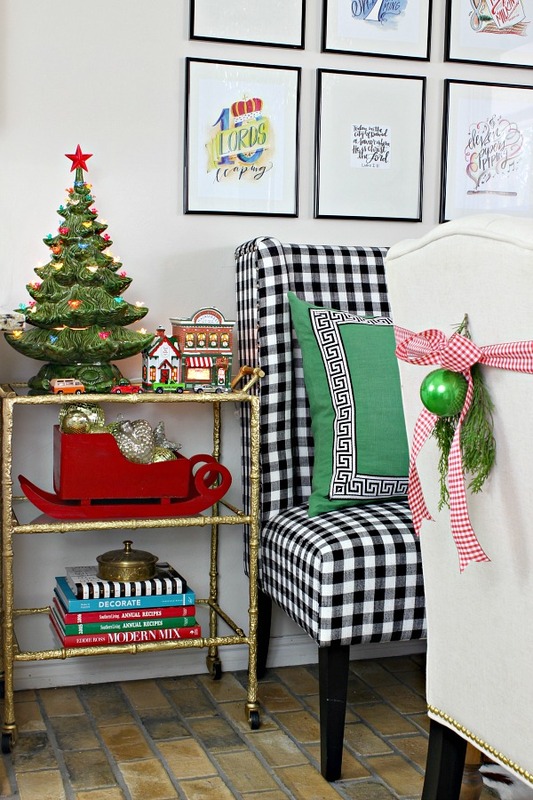 Your gingham settee is to die for! MERRY CHRISTMAS FROM OUR FAMILY TO YOU! CREAM CHEESE SAUSAGE DIP, THE HIT OF THE PARTY!